John Watling’s Distillery has joined the export market, recently opening up its rum for sale to United States consumers. In a press release announcing the move, the distillery said it began the export of its rums, with the signature name John Watling’s, to the U.S. on January 2 of this year. The assortment of rums is available for purchase on the company’s website www.johnwatlings.com., and is being distributed by Park Street Imports, a technologically-driven provider of alcoholic beverage importing. 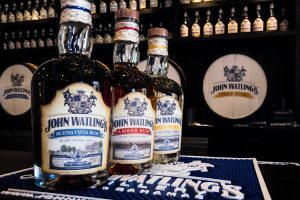 “John Watling’s rums are named after John Watling, the English buccaneer who, in the 1670s, landed on San Salvador, The Bahamas, and named it after himself,” the release states. “They have been recognized and awarded by ‘The Fifty Best’ in New York City, New York; BarLife Magazine from the Czech Republic; Rum Bahamas in Nassau, The Bahamas; the Taste of the Caribbean competition in Miami, Florida; the Beverage Testing Institute in Chicago, Illinois; and the Concurso de Ron in Madrid, Spain,” according to the release. John Watling’s Distillery employs more than 20 Bahamians, in lieu of using machines to fill, cork and hand label each bottle. Visit John Watling’s mini webpage on The Bahamas Trade Information Portal.